Jesus Died Alone composed by Joel Raney. For SATB choir. Lent. Octavo. 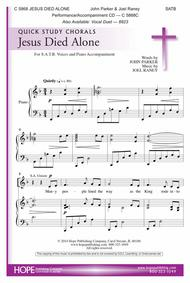 Published by Hope Publishing Company (HP.C5868).For SATB voices, John Parker and Joel Raney collaborated to give us this thought-provoking Lenten ballad. The rich text transports the listener to several Biblical scenes underscoring the solitude of Christ as he faced death. Joel Raney's impassioned original music evokes the drama of the sacrifice.